Derby County boss Frank Lampard reiterated the need for his entire squad this season after the Rams’ Carabao Cup win over Oldham Athletic. Tuesday night’s tie saw Lampard make six changes to the side that faced Leeds United in the Championship at the weekend and handed full debuts to new recruits Florian Jozefzoon, Jack Marriott, Scott Malone and George Evans. 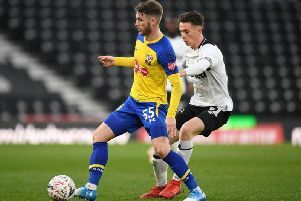 The Rams ran out comfortable 2-0 winners at Boundary Park on the night thanks to a goal in each half from Fikayo Tomori and Chelsea loanee Mason Mount. “We have bought players in, so this is going to be a bit of a work in progress and we have to give minutes to these players,” Lampard told Rams TV. “I thought some of the players came in and did very well, so that was a great exercise for us on all fronts really. Lampard added it was a “professional and comfortable” performance for his side against a potential banana skin. “You have to approach these games in the right way and we did that. The attitude was spot on. The only downside we are taking away from the game was that we didn’t score more. “We created a lot of chances and should have done better. There were also a few moments where we let them in, but that’s normal in these types of games. “It’s not easy to have 90 minutes where you have it all your own way, but we played very well,” he added.